Guilt is powerful, paralyzing even. It holds some of us more captive than others, and strikes in unpredictable places. I am prone to guilt, and I worry too much. My husband claims that I worry about worrying, even when I have nothing to worry about. This I can’t deny. On Monday I was wracked by guilt as I swam laps outside, enjoying the mid-70’s sunshine in a pool heated comfortably. I kept company with the retiree water aerobics class, and feasted my eyes on the very tan and equally toned lifeguard leading the crew. I did so as my friends and family were being pummeled by Sandy, and as the house we still unfortunately own was left to weather the fury powered only by a back-up marine battery. This battery, plugged into the sump pump, is like the little dutch boy’s finger jammed into the hole. Should it give, the system fails and the floods conquer. Only when power is restored are we out of the woods. Still we’ll own the damn house. At least this time around I’m not stuck inside that house with famished, stinky, cooped-up children. The guilt of my feeling relieved magnifies as I know that others are in dire condition– financially, physically and emotionally. Thousands of miles away from them we carried on with living: school, work and Halloween. My guilt surged on Halloween night, and not because in the chaos of the day I mistakenly switched my kids’ lunch items which they quickly brought to my attention after each went slightly hungry. Rather, I was involved with perpetuating a fallacy that was revealed in the thick of trick-or-treating. We discovered the truth: the California condor is not, in fact, the state bird. The quail won that honor back in 1931 when it beat out the condor for the title. Not only is the condor frightfully unattractive, it’s also nearly extinct, so two valid reasons for missing out on top honor. The condor, however, is on the state quarter as consolation prize. Hence the confusion, and one explanation for how we let our creative, crafty and proud seven-year-old don a condor costume and inadvertently dupe the neighborhood. As well as friends, teachers, administrators, parents and passers-by. 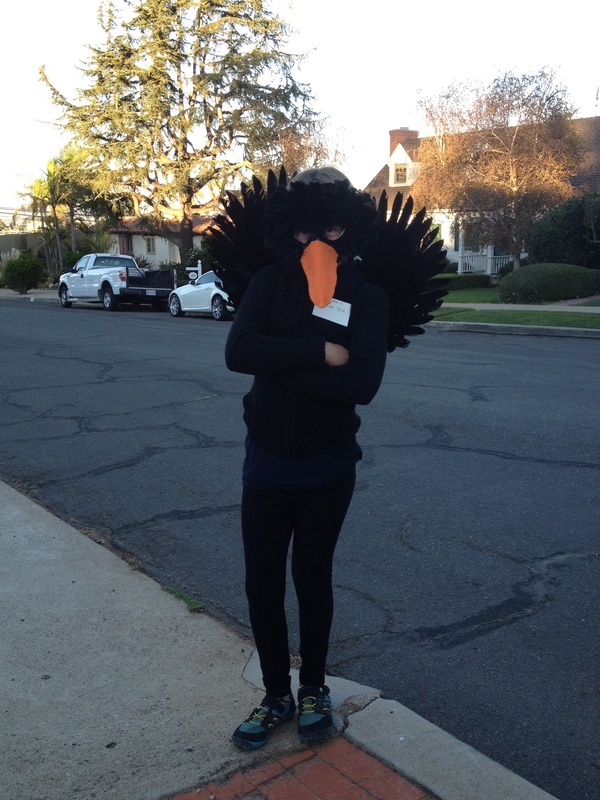 In the months leading up to the festivities our daughter had announced to anyone and everyone that she would be representing the state bird, the condor, on Halloween. She’d be devastated to know that her costume– her inspired efforts– were inaccurate. I couldn’t tell her right then and there. Plus I needed to be sure. In the haze of my Halloween hangover the next morning I scoured the internet for all things condor. Remember– the purpose of a sabbatical is for research. I’m now an expert in condor traits and facts, including full knowledge of why they purposefully defecate down their legs. Most importantly I concluded that they are, indeed, not the state bird. When I shared my findings with my condor-loving child later that afternoon, there were tears. I recognized those tears– they were guilt-ridden puddles of shame. My condor kid truly believed that everyone at school, in the neighborhood and at the party where she had won first prize for best costume would deem her a liar. She even suggested that she should return her grand prize, the highly anticipated and already beloved MG (gaming system) that is en route from China as I type. Worst of all, she implored through her sniffles, Why didn’t you check more carefully? How right she is, and how guilty I feel. A stickler for accuracy, I try to triple-check everything. I don’t like to be wrong, and moreover, I refuse to make errors without taking ownership. I figured that she, too, would want to know the truth and to hear it from me instead of being called out by someone else. I’d rather be the bad guy. I’ll wipe away her tears, absolving her of guilt and absorbing it into my own. There is little I can offer from afar to aid those affected by the hurricane, other than to open our home up for a hot shower (even without electricity we have gas-powered hot water). And we can’t redo Halloween unless we head to New Jersey to partake in the postponed affair on November 5th. The best I can do is to make a subtle modification to an essential part of that costume, and tuck it away in a keepsake box as a reminder that, when having erred, we move forward not with guilt but in good humor. This entry was posted in Uncategorized and tagged California, Children, Condor, Family, Guilt, Halloween, Hurricane Sandy, Motherhood, New Jersey by Rebecca Marks Rudy. Bookmark the permalink. OMG! Who would vote the Quail, a little ground bird the size of a Pigeon as the State bird? Probably the same people who voted Gov. Moonbeam, Jerry Brown in to office for a 2nd time. Think of the massive California Condor with it’s amazing wing span, soaring above the hills, catching Thermals. Now that is a Bird deserving the stature of a State Bird. No worries, Emma, All my friends are going to the polls on Nov. 6th and vote for the CALIFORNIA Condor as the HONORARY State Bird. Your costume was not only Fantastic, but Unique and Creative. That is why you won the prize. You deserve it, just as the California Condor deserves to be the State Bird. By the way, people hunt and eat Quail. You shouldn’t have a State Bird you can eat! Ask Jeremy about his Quail Hunting Foray as a Teenager! (Maybe they quail hunting was why J forgot that it was the state bird?) I love the re-do on the name tag. Cheers to moving forward with good humor! 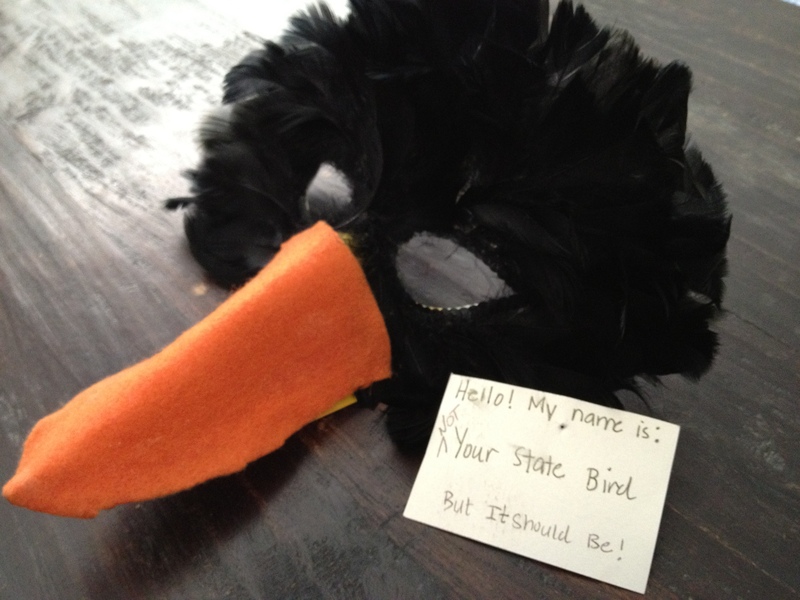 And that costume rocks, state bird or not. Go E!!! According to J it was dove hunting. All the better….